Dental implants are medical devices that serve to restore structure and functionality to your mouth. A dental implant bonds to the jawbone, making them much more utilitarian than dentures. You do not have to remove your dental implants, and they share the appearance of natural teeth. 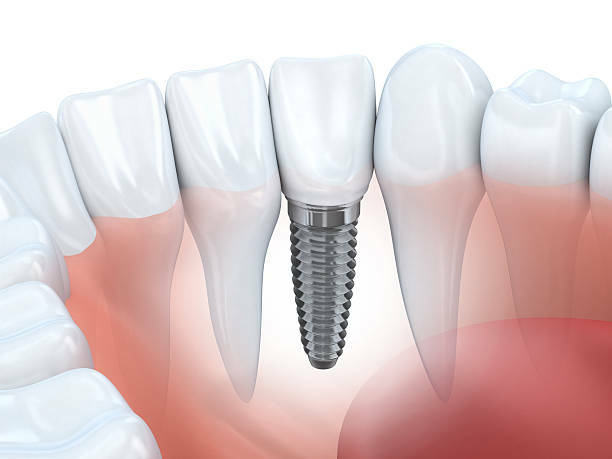 A dental implant is made when a metal post is fused into your jawbone below the gums, and an artificial tooth is connected to it. The artificial teeth will not fall out of your mouth after they are mounted to the implant. Dental implants have numerous benefits. Chief among these are the fact that a dental implant can serve to preserve healthy jaw bone. They maintain the integrity of the mouth and prevent erosion of the jaw better than regular dentures can. Additionally, implants can be more comfortable than dentures. As they do not have to be removed, you can go about your oral care routine as you would normally. They also strongly resemble natural teeth, which may increase your overall confidence. Dental implants aren’t for everyone though. You must have healthy jawbone in which to affix the implant. If you have had significant bone erosion, you may not be a good candidate for a dental implant. You also need healthy gums, as the implant process does carry with it a small chance of infection at the surgical site. They may also cost more than more traditional dentures and veneers. Your insurance carrier may or may not cover all of the fees associated with receiving a dental implant. NuSmile Dental offers free consultations to all patients seeking to receive a dental implant. We work with you and your insurance carrier in order to find the best tooth replacement solution for you. Choose the best cosmetic dentists in Philadelphia for your needs today by making an appointment with our office using the form below.